Bilirubin Levels Chart is a table of common bilirubin levels that cause jaundice yellowish color of the skin and eyes sclera, includes normal bilirubin levels, high bilirubin levels, and low bilirubin levels in the same place. Where bilirubin comes from and where bilirubin goes to? Bilirubin comes from degradation of hemoglobin and cells breakdown by spleen or other organs, bilirubin enters blood stream as large insoluble molecule which has the term (unconjugated), when reaches the liver, hepatic cells perform chemical reaction to make bilirubin soluble in the blood by bound it to the glucuronic acid by the enzyme glucuronyltransferase which then called (conjugated), conjugated bilirubin go from the liver to the intestine and undergoes reduction to the form called stercobilirubin which give the stool its yellowish color, another part of direct bilirubin go to urine through the kidney after being transformed to a compound called urobilinogen (urine dye) which gives the urine the yellowish color. els in the blood, usually at levels such as 30 mg/dl, Bilirubin is a highly neurotoxic substance. Medical short codes for TSB, DSB, ISB are total, direct, indirect serum bilirubin respectively. Total bilirubin is the sum of all bilirubin forms in the blood, and not representing different type of bilirubin in the body. 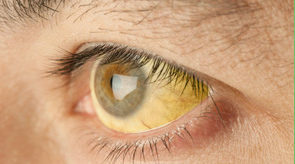 The bilirubin shown in urine and skin at serum bilirubin levels between 3.0 to 5.0 mg/dl, skin jaundice and eyes yellowish discoloration appear, urine color become dark yellow or as light tea when direct bilirubin is high in the blood, when indirect bilirubin is higher than 25mg/dl in the blood, it may show greenish plasma color as a result of sever elevation of indirect bilirubin (due to increased activity of biliverdin reductase enzyme which reduce biliverdin to bilirubin). Low levels of bilirubin are generally not concerning and are not monitored as there is no studies confirm a risk for flow level of bilirubin. Total bilirubin less than 0.4 is not a concern of abnormalities. Indirect less than 0.3 is another insignificant bilirubin level. Normal bilirubin level is a bilirubin value that means there is no diseases could be found in the sources of synthesis, processing, and removing of bilirubin. normal bilirubin values lie between reference ranges, the lower limit, and the upper limit. Direct bilirubin 0, 0.1, 0.2, and 0.3 is normal results and cannot be a cause of jaundice unless indirect bilirubin continue to be high. Indirect bilirubin 0.8, 0.7, 0.6, 0.5,0.4, and 0.3 are all normal levels of blood bilirubin. Total bilirubin level 0.9,0.8,0.7,0.6,0.5,0, and 4.0 are normal and not jaundice whatever is the result of direct and indirect bilirubin. Recommendation: if it’s the first time you take a bilirubin test, there is no further investigation when results is normal, if you’re on medication, then you’re just fine and continue to keep it normal. Are the bilirubin levels that reach the normal upper limits or slightly above, can’t be taken seriously as jaundice, and need for new test after few days, sometimes borderline bilirubin levels shown up when the person is on medications. Bilirubin direct 0.4 with normal indirect and total bilirubin results. Bilirubin indirect level is 0.9 and total is 1.0 mg/dl. Bilirubin total is 1.1 and normal direct and indirect bilirubin. Bilirubin direct level is higher than the total bilirubin level, for instance; direct 1.0 and total 0.8 mg/dl. Bilirubin levels show slight increase above the upper normal limit; for ex. Total 1.1 and 1.2 mg/dl. Total bilirubin results are very low: 0, 0.1, 0.2, 0.3 mg/dl which could be false low results or wrong test. High Direct bilirubin helps in diagnosis the liver function and post hepatic jaundice caused by obstruction of bilirubin in common bile ducts (obstructive jaundice) by gallstones, tumors, or scarring of bile ducts, also some diseases cause liver function failure such as viral hepatitis, alcoholic liver disease, and drug reactions. High Indirect bilirubin helps in diagnosis of pre-hepatic jaundice caused by rapid hemolysis of red blood cells of infants or adults such as hemolytic anemia, pernicious anemia, also blood transfusion reaction, and Cirrhosis cause high indirect jaundice, inability to produce the enzyme which converting indirect to direct is a common cause of jaundice without a disease, this case known as inherited Gilbert syndrome and cause relative elevation in indirect bilirubin. Indirect bili. 3.0 high, direct bili. 0.3 normal. Indirect bilirubin 10.0 very high, slightly elevated direct bilirubin 0.5 mg/dl. Direct bilirubin 7.5 mg/dl high, indirect bilirubin normal 0.6 mg/dl. Direct bilirubin 11.0 mg/dl high, indirect bilirubin slightly elevated 0.9 mg/dl. Direct bilirubin 9.0 mg/dl, indirect bilirubin 8.0 mg/dl. Indirect bilirubin 12.0 mg/dl, direct bilirubin 11.5 mg/dl. 1 week to 10 days after birth: indirect 13.0, direct 1.0, and total bilirubin 14.0 mg/dl. 2 weeks: should be reduced towards the normal limits, if increased; may show total bilirubin over 20 mg/dl, which is very high and incubation is required, extremely elevated total bilirubin higher than 30 mg/dl is a serious condition and may lead to Kernicterus which is deadly brain damage. For treatment and follow up tests of newborn jaundice, please visit this topic; jaundice in newborns, and bilirubin blood test results. Gilbert, Crigler-Najjar syndrome, and alcohols are common reasons of high bilirubin levels without an obvious disease. In Crigler-Najjar syndrome, at birth or in infancy the child show jaundice with Severe unconjugated hyperbilirubinemia, if bilirubin is extremely elevated can cause condition called kernicterus, the accumulation of unconjugated bilirubin in the brain and nerve tissues and lead to brain damage and death. Remarks: Hereditary jaundice show steady bilirubin levels and continuous follow up. Have you got help for this explanation? please share the knowledge, no matter if you ask for additional help.